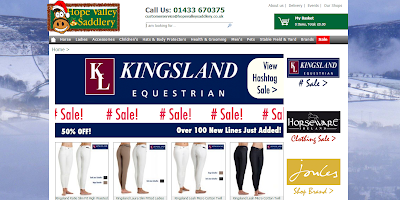 Last month, I was on Facebook when I saw one status from Hope Valley Saddlery announcing the Kingsland sales. I am a fan of the brand so I decided to buy one pair of white breeches, their retail price is £149 and they were on sale for £45. I chose the Katie model which is slim fitted and high waisted. After placing the order, I received an e-mail with the confirmation saying "we'll ship it as soon as we can. We'll also make sure that we send a dispatch confirmation, including all your tracking details the second your parcel has flown our nest!" but I didn't receive any dispatch confirmation so I decided to send them an e-mail. The customer service was good as they answered me few hours later with the tracking details. 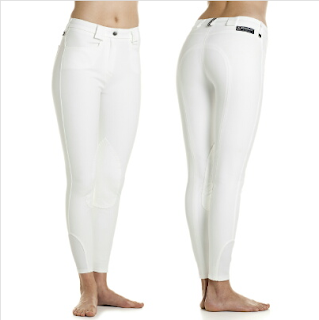 I received the breeches 13 days later and they were in perfect condition! Overall, I think Hope Valley Saddlery is an amazing place to shop and make great deals, always knowing that the people on the other side are serious! Went to check them out after I saw this post and ended up finding Amigo rugs 2 for £40! Super cheap, thanks for pointing out their sale!! What an awesome site, thanks so much for sharing! I hadn't heard of them before, am going to be good till payday next week and see what bargains' ll be available then! You're welcome! Their prices make me want to buy so many things!